Every year the entire world sees the Indian community celebrate Ganesh Chaturthi with great enthusiasm and participation. Preparations for this sacred festival begin months in advance and the actual day of celebration sees a grand observance of the occasion complete with elaborate execution of traditional rituals, singing of devotional songs, fervid dancing, cracker-bursting and loud chanting of "Ganpati bappa morya..." TheHolidaySpot brings to you a precise article on the celebrations of Ganesh Chaturthi. Learn how Ganesh Chaturthi is celebrated annually in India and the different customs that mark Ganesh Chaturthi festivities. If you like our article "How is Ganesh Chaturthi celebrated", do not forget to click here and refer it to your friends and loved ones. 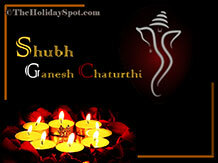 Shubh Ganesh Chaturthi! Celebrate this year Ganesh Chaturthi by having this religious screensaver of lord ganesha where you can see him in different looks along with laddus and diyas. 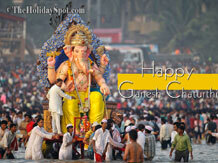 Believed to bring in good luck and destroy Hurdles, let Lord Ganapati rule over your desktop. 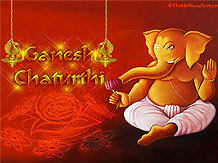 Spread the name of Lord Ganesh. Celebrate the auspicious occasion of Ganesh Chaturthi by having this musical screensaver which highlights lord Ganesha and Lord Shiva together. Just Download it. 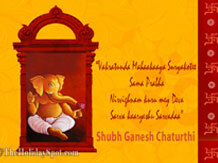 Download this religious Ganesh Chaturthi Screensaver and adorn your desktops with various Lord Ganesha's images. Make sure this musical screensaver is played throughout the day so that a pious atmosphere is created everywhere. 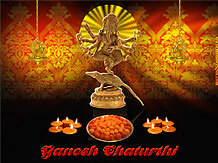 Ganesh Charurthi is celebrated almost in every Indian household. So like an ardent devotee of Lord Ganesha, make sure you download this screensaver and install it as it is sure to portray emotions of tranquility and piousness everywhere. Download this religously laced screensaver and celebrate the festival of Ganesh Chaturthi in an unique way. Make sure you spread your wishes amongst your fellow mates and loved ones through this holy screensaver. Rekindle your secular side by installing this Ganapati mantra screensaver. 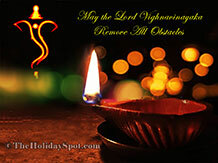 This screensaver is sure to enchant you and your religious emotions to greater extent. So just install it and see how this screensaver creates an ambience of piety.